Since being in the USA I have realised everything is bigger. The Cars. The Food. The People. 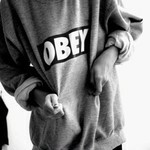 Although the biggest and best oversized trend is Jumpers. Everywhere you look this season oversized jumpers are the thing being worn. As the days get warmer (woohoo! ), an oversized jumper is the easiest thing to slip over your head as you get out of bed on a cold morning, or in my case roll reluctantly out 20 minuets before a lecture starts. The Homies Jumper above is my newest purchase, yes, granted it did hurt the purse a little bit but it was so worth it! The Hoodie is from LA Based designer Brian Lichtenberg who's first collation plays on the names and logos of famous luxury brands. Hermes- Homies. Simple.